BRIGHTON, Mich. - The summer and its holidays are upon us, which means it's time to fire up your grill. One of the best things about summer is being able to grill out with family and friends, that's why we've come up with 9 great grilling tips for you to get the most out of your BBQ. 1. Preheat your grill 15-25 minutes before you start cooking. Much like the oven inside, your grill cooks best when it's properly heated. If your grill has had time to warm up, it will properly sear your food on contact, keep the insides moist, and also keep your food from sticking. 2. Clean your grill when it's hot. Food leftovers and debris comes off a lot easier when the grill is hot, so use a grill brush to clean your grill rack after it's pre-heated, but before you slap your food on. 3. Use the hand test to check if your grill has reached temperature. Place your hand about five inches above the grill rack; it's at high temperature if you have to move your hand after 2 seconds, medium temp. if you move your hand after 5 and low temp if you move your hand in 10 seconds. 4. Oil your grill up to prevent sticking. Using tongs and an oil-soaked paper towel, rub your grill rack down. This will keep your food from sticking and give you a nice looking sear. DO NOT however use cooking spray on a hot grill. 5. Avoid cross-contamination. While it might be obvious to use separate cutting boards, knives, etc. 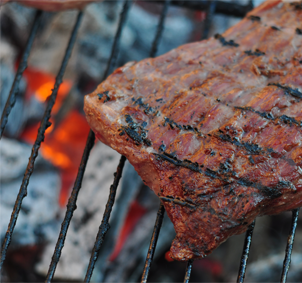 when dealing with raw meat, many don't pay attention to their marinade. Make sure to prepare a little extra marinade to use on your food when it's cooking, and don't use the marinade that was used on the raw meat. It's important to remember to never baste with the marinating liquid, as it's easy to cross-contaminate this way. 6. Speaking of marinating, marinate your meat! It infuses your food with great flavor, ensuring that your guests will love it. For steak, we recommend using a mixture of soy sauce, olive oil, lemon juice, worcestershire sauce and various herbs. 7. Check the temperature of your meat. This makes it super easy to know if your meat is done, or if it needs to cook a little longer! Your guests will be so impressed with your food knowledge after you whip out an internal temperature gauge. 8. 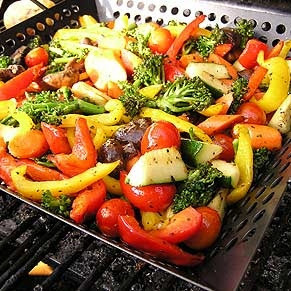 A grill basket/rack is perfect for veggies, fish, etc. 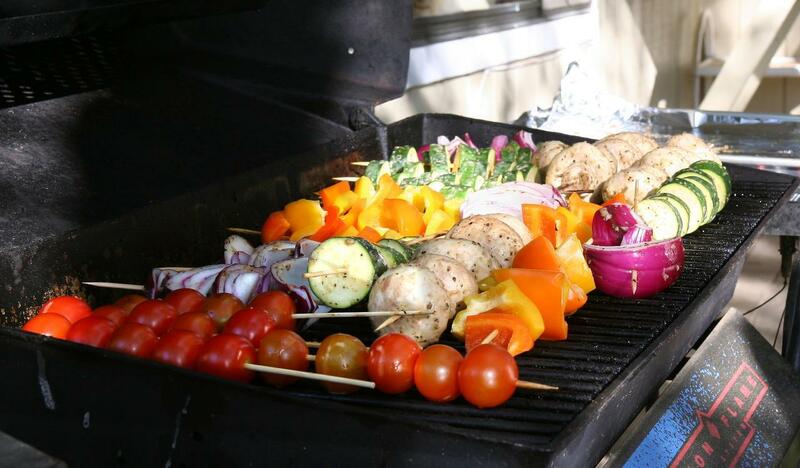 Unless you're making kabobs like the above picture, a grill basket will keep your veggies from falling through the racks. Not to mention, it'll cook them to perfection and you can serve them right out of the basket. 9. Let your food rest - especially the meat. Not only does this give your food time to cool down so it doesn't burn you, it also allows the juices in your meat to redistribute giving it a great taste. Whether you're a grilling master or an excited beginner, these 9 great grilling tips will make you look like a professional to your family and friends. Need a reliable vehicle to get you to your BBQ? Stop by our Wixom Area Ford Dealership today and we'll help you into a Certified Preowned Car or a New Ford Truck. Brighton Ford is located at 8240 Grand River Ave. just north of I-96 in Brighton. We are a family owned and operated business that strives for customer satisfaction. For more information on Brighton Ford visit BrightonFord.com or give us a call at (800) 836-8206.